I was born in Portland, Oregon, in 1939. As a young boy I remember trips to the beach with my parents and just going off by myself to collect agates and fossils. 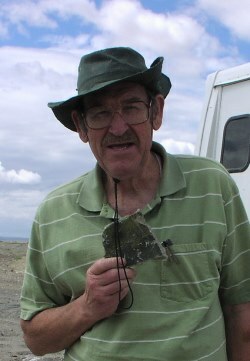 Later on would come a trip to the Priday Ranch for thunder eggs and to Idaho to visit my maternal grandparents and look for agates and petrified wood in the Weiser area. After three years in the Army, I studied geology at Portland State College and took classes from Professors Hammond and Van Atta (Professor Allen was on leave the first year I was there, and I don't remember why I didn't have a class from him my second and last year there.) After graduation in 1964 I went south to look for work and ended up as a field assistant/lab tech for the Alaskan Branch of the USGS at Menlo Park, California. After a year there, I returned to school at San Jose State and from there went on to Johns Hopkins, where I met and married Sally. I then took a job with the Ohio Geological Survey, and worked out of Sandusky, Ohio, for 10 years on research largely related to Lake Erie shore erosion. Our two daughters, Katy and Anna, were born there. We then moved to Akron, where I taught for 19 years as a sedimentologist/stratigrapher in the Geology Department at the University of Akron. We moved to Beaverton in 2001, and Professor Burns at Portland State encouraged me to join GSOC. What a good idea! I enjoyed the field trips and talks and just meeting interesting and energetic people, plus learning some new geology that I had missed in my frantic two years at PSC. After several years with GSOC, my father's banjo and the world of plants and animals beckoned to me, but I still fondly remember my time with GSOC. My two years first as VP and then President of GSOC was certainly not something I would have foreseen since I have no formal geology education beyond a few general ed college courses. What I do have is a BS in Biology/Botany from Humboldt State University in northern California and a Masters in Environmental Studies from The Evergreen State College. I became interested in the revegetation aspects of mine reclamation while preparing for graduate school and decided to focus on rehabilitation of degraded landscapes. This interest led me to post­ graduate contract work with the state of Washington and Thurston County where I assisted in the development, implementation and enforcement of mining regulations. Private sector·employment as a consultant to the mining industry followed. My work in the reclamation field has provided me with some practical applied science knowledge of slope stability, stratigraphy, and mineralogy. Fossils too - I've had an interest in paleontology since I first knew what the word meant. Growing up in western NY State I amassed a carefully labeled collection of fossils from the creek beds and escarpments that provided hours of blissfully unsupervised entertainment for a curious child. With better guidance and more self-knowledge at the college level I probably would have found my niche in the sciences as a plant paleontologist. As I gradually retire from the consulting business, I find myself happily indulging in many interests that were put on hold over the years: studying lichen and mushroom taxonomy, monitoring migratory dragonflies (with the Xerces Society), maintaining an aviary of canaries and finches, and spending lots of quality time with my beloved horse Mateo and donkey Oliver. Janet Rasmussen was born April 10, 1950, in Pendleton, Oregon. She met her first husband, Dave Logsdon, in Alaska, and married him in 1972. While she took many college courses after high school, she mostly stayed home to raise their fourchildren: Lisa, Reuben, Grace, and Russell. She later obtained her nursing degree while living in Keokuk, Iowa, Dave's hometown. They divorced in 1989 and she returned to Oregon with her children. Once the children were grown, Janet quit her full-time nursing job and went back to school for a geology degree, working part-time as a nurse. In 2003 she met her husband, Doug Rasmussen, of McMinnville. They married in 2004 at the site of the cabin they were building in the Elkhorn Mountains of Baker County, Oregon. She received her BS in Geology at Portland State University in 2005, and her MS in Water Resource Science at Oregon State University in2009. Janet and Doug both enjoy attending geology lectures and field trips, spending time at their cabinand working on Doug's farm in McMinnville. They live in Corvallis, Oregon. 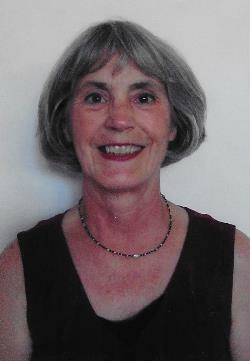 Janet has served on the Board of Directors and as webmaster for GSOC. She was President in 2008-2009. Her 2008 President’s Field Trip featured the gold mining country of Baker City, Sumpter, and Granite, Oregon. Carol’s second President’s field trip was of the overall geology of the Cascade Mountains in Oregon and the hydrology of the Deschutes River Basin. The trip’s guest leaders included Richard Conrey of Washington State University, Ken Lite of the Oregon Department of Water Resources, Todd Cleveland of Deschutes County Planning, Robert Jensen, USGS, and Richard Bartels of GSOC. The group also toured the Earth2O bottling plant in Culver, Oregon. 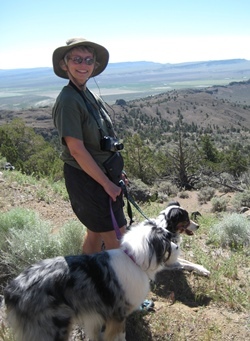 The photo shows Carol and her Australian shepherds Trinity and Nick, who accompanied her on a GSOC field trip to the Oregon outback in 2008.